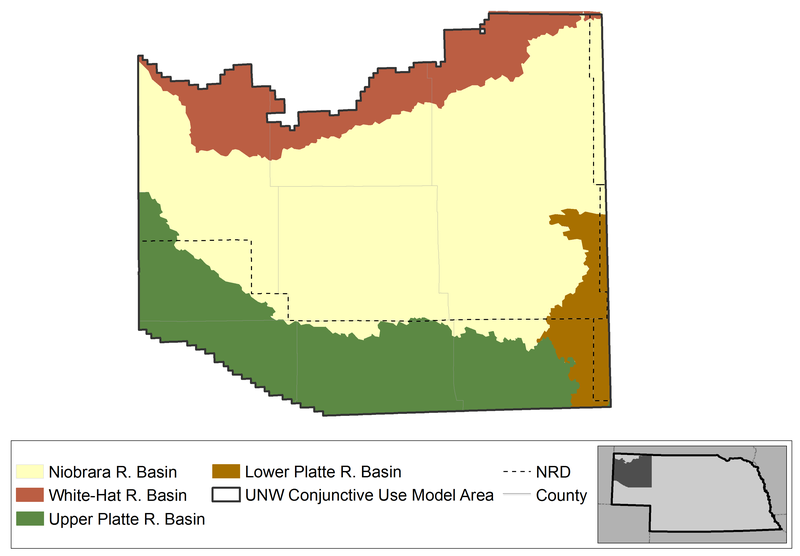 The Upper Niobrara-White (UNW) Model provides a tool for evaluating water management scenarios and estimating the basin water supply and hydrologically connected areas for the Department’s annual evaluation of the availability of hydrologically connected water supplies. The UNW Model domain covers the upper portion of the Niobrara River Basin, with its eastern boundary roughly aligning with the county boundary between Sheridan and Cherry counties. Since the mid-20th century, irrigated agriculture has greatly expanded in the region. Increasing use of groundwater resources has led to depletion of hydrologically connected streams and the underlying aquifer, prompting the designation of the Niobrara River down to the Dunlap diversion gage as fully appropriated in 2004. This hydrologic model is part of an effort to improve the tools available for analysis of water supplies and uses in the upper Niobrara River Basin. Modeling efforts are focused on providing information to help minimize groundwater depletion and sustain groundwater supplies in regions that have been determined to be fully appropriated. This model can help water resource managers better understand hydrologically connected surface water and groundwater supplies and minimize the negative impacts of human activities on the resources. The UNW model includes a surface water operations model, a groundwater flow model (USGS MODFLOW-2000), and a soil water balance model used to investigate the system’s response to different forms of vegetative growth (CROPSIM).